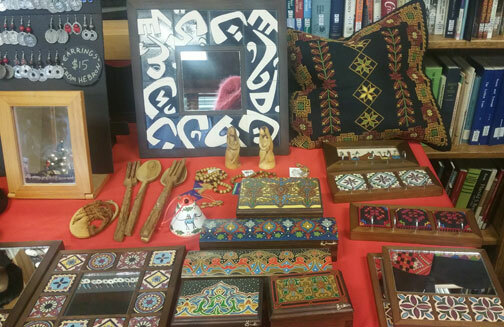 Since 2004 the Crafts Committee of Madison-Rafah Sister City Project has worked with a variety of fair trade organizations in the Gaza Strip and the West Bank to purchase mostly traditional crafts. They are then sold in the Madison area at various holiday fairs, house parties, and other political and cultural events whenever possible. We purchase crafts up front at fair trade prices, which are then marked up very slightly to cover shipping and breakage; all proceeds from sales go back into a revolving crafts fund that is used specifically and only to purchase more crafts. This enables the people who create these beautiful crafts to help support their families in impoverished areas of Palestine, and helps to support their economy. Prices range from $8 to $100, with most items below $30. 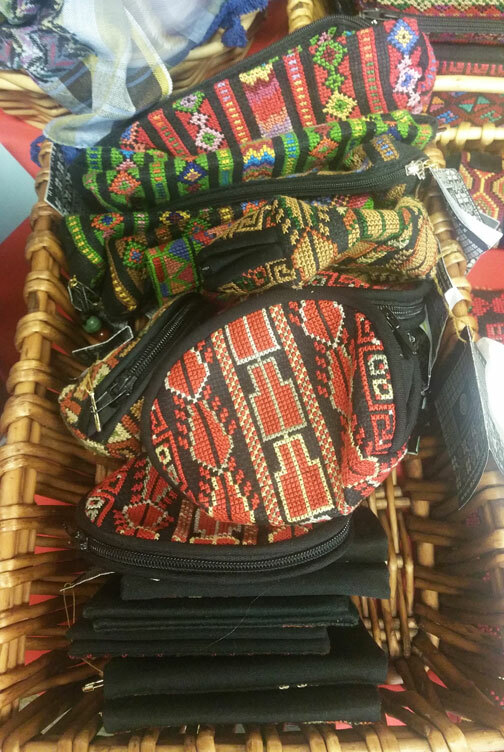 We do our best to purchase mostly from Gaza, but we have had to branch out to some West Bank organizations as Israeli border closures can make it difficult to get crafts out of Gaza. 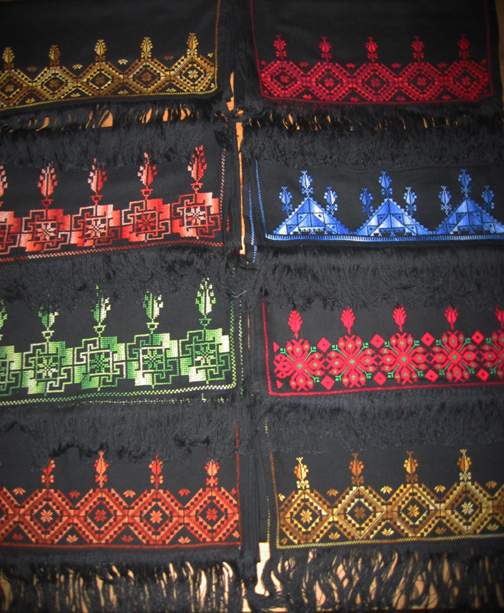 Palestinian Embroidery (al-Tatreez*) on purses of various sizes, scarves, shawls, business card holders, eyeglass cases, pencil cases, bookmarks, pillowcases, and more. 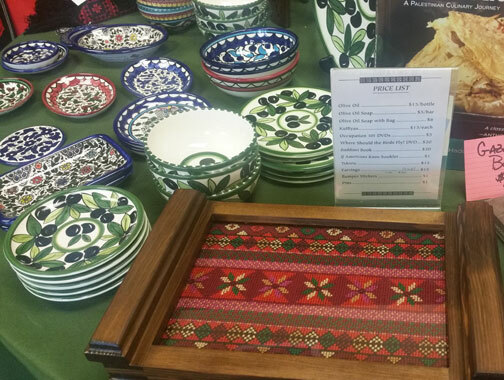 Traditional Palestinian Ceramics, including bowls, plates, and mugs of many sizes, tilework around mirrors and keyholders, and more. 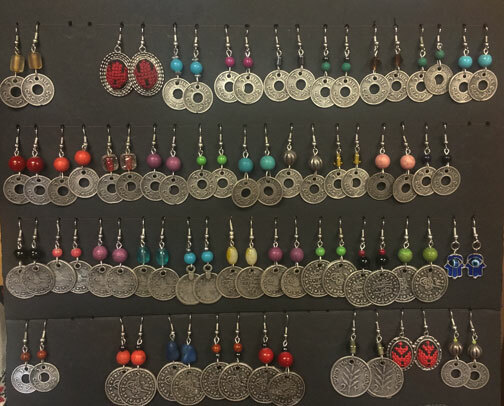 Earrings from the Hebron Women’s Co-op. Kuffiyehs, the traditional scarf** which has come to symbolize Palestinian resistance. We have a collection in a wide assortment of colors, from the more traditional red/white and black/white to a multitude of gorgeous colors. 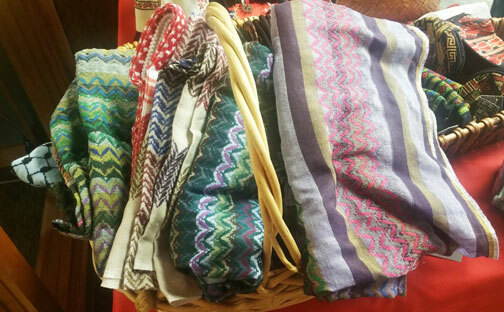 These are purchased from the Hirbawi factory in Hebron, the last Palestinian-owned kuffiyeh factory in Palestine. Olive Oil Soap made in Nablus by the Hasan al Shaka’a factory. Date varies, usually mid to late winter. See their website for latest details. Checks to support this work can be made to “Madison-Rafah Sister City Project” with the memo “Crafts” and mailed to the address above. This project requires the help of people with persistence, dedication to fair trade and global exchange, and an interest in advancing the cause of women in Palestine. For further information, contact RafahSisterCity at yahoo.com. 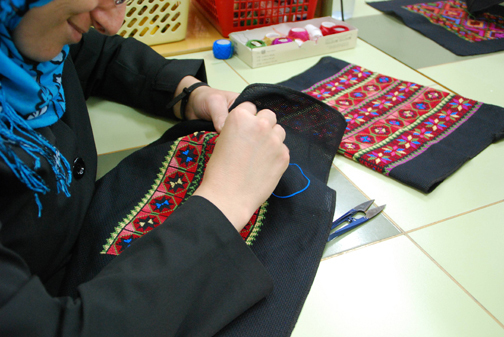 * Palestinian embroidery, or al-Tatreez, is an integral part of the Palestinian geographical and cultural landscape. Historically it has been possible to identify the specific region in Palestine where the embroidery was made, and the status of the person owning or wearing the embroidery, based on the color combinations of the thread and the design and color of the cloth. ** The Arab kuffiyeh has been used for centuries throughout the Middle East for protection from sun, wind and sand. 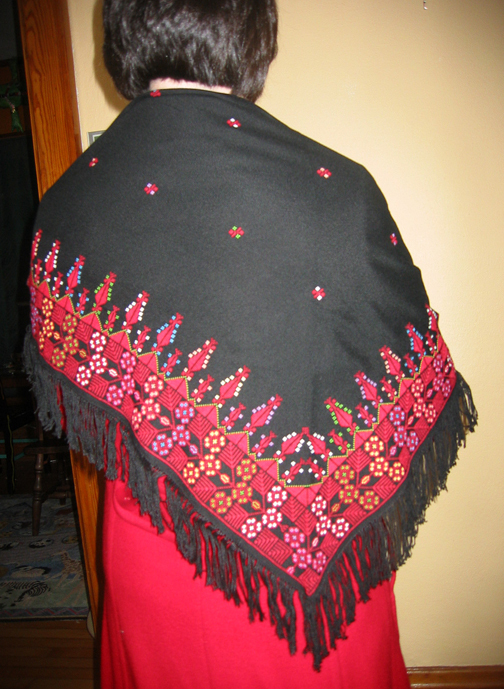 In historic Palestine, it was often worn by those of lower social status and rural background. In the 1930’s the kuffiyeh became a symbol of Palestinian nationalism and resistance, especially during the 1936 revolt against the brutality of British colonial rule. City dwellers wore it to express their love for the land and their solidarity with the rural fellaheen (villagers) who increasingly faced dispossession by large-scale European Jewish immigration to Palestine. In the 1960’s, both the black-and-white and red-and-white versions of the scarf became an iconic symbol of the revived Palestinian national movement – it was the favored headwear of Yasser Arafat and other Palestinian leaders.